Subscribing to monthly readings is ideal for those who would like to have a fully customized reading with a rich dialogue around what comes up, but feel they do not have the time to schedule regular in-person readings. We will communicate each month by email (or your preferred electronic communication method) about how things have gone during the month, what new insights or issues have appeared, and how you’d like to go forward. I limit the number of monthly subscribers so that I can establish a personal connection with each one of you, mentoring you as you navigate your goals and develop your own intuition. With all of my current subscribers, I’ve also been able to connect them with power animals and guides who appear to me in order to connect with them. It has been an unexpected and lovely surprise. There are still a few spots left - don’t miss out! Save 10% when you pay upfront for an annual subscription or choose the convenience of a monthly automatic payment. I do a personal reading every month to see what lies ahead, what currents of energy will influence me and my surroundings, and where I should set priorities and intentions for the weeks ahead. I find that this significantly eases any sense of anxiety I have about upcoming events or commitments, and helps me plan where to spend or conserve my energy. This practice also allows me the chance to spend some much needed attention on myself - when I do the reading, and every time I check back in, looking at my notes and photos of the spread. I find I can also use the reading as a way to prompt or support my personal journaling, and in that way I can better emotionally process the events of my life. It would be my honor to help you incorporate monthly tarot readings as part of your self-care routine. You choose when you’d like to receive your reading: at the beginning of each month, on full moons, or on new moons. If you are a calendar-oriented planner, the beginning of the month will probably work well for you. If you would like to connect to yourself and your spirituality during a time of amplified dreams and emotions, that supports gratitude and appreciation what you’ve accomplished and of the beauty in all things, choose to receive your readings on the full moon. For a reading that supports goal and intention setting, as well as providing insights for upcoming projects, choose to receive your readings on the new moon. Unless you have a specific BIG question for a month (see more below), your subscription will be for a 12-card or 16-card spread. The left column in the spread will encompass the overall or most powerful energy influencing each week of the month (which is made into four even weeks for greatest simplicity and clarity). The second - third or fourth columns will be customized to you and what you’d like out of your reading. 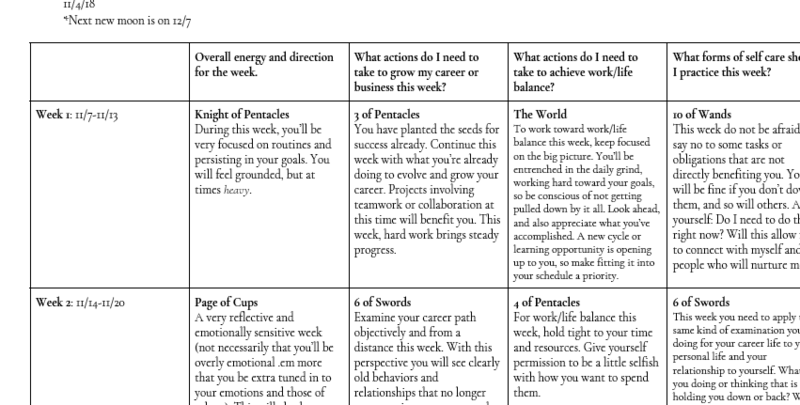 These additional columns (you will choose to have two or three additional columns) could each indicate a detail about the energy and events of each week - overall, or in sequence (beginning, middle, end). You could also choose to receive information from the universe more specifically pointed at facets of your life and/or work. One column could be about what you need to do this month to advance your career or current projects. One column could be about how to nurture a relationship. You could devote a column to how to engage in self care each week. When you subscribe, you can include whatever ideas you have about how to focus these columns in your reading, and we can discuss it before I perform your first reading. At any time during your subscription, we can change directions and ask the cards about something new. I will routinely check in with you to see how things are going. When you have a critical decision to make or something weighing on your mind, especially when it’s something you are emotionally attached to and something you may have a lot of information on, but you still can’t figure out how to go forward, we can discuss a custom reading that discards the weekly format and will give you what you need to address your big question. The number of cards and spread for this reading will depend on your needs, and we will work together to decide the best option.